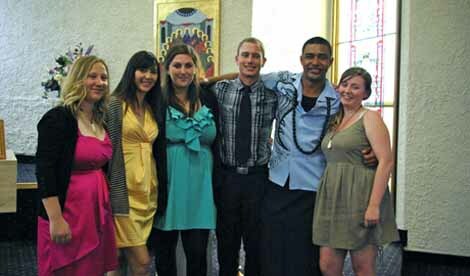 Six young people who completed the Marist – Challenge 2000 Gap Year programme in Wellington received their certificates at a graduation ceremony on Sunday. At the graduation students had an opportunity to say what they had learned from their experience. Several spoke of about how their horizons had been expanded and how they had successfully met the challenge to achieve things that they had previously thought were beyond them. As well as being placed with a variety of social agencies where they work for three days a week, the gap year participants helped run retreats and formation programmes for secondary and primary school aged people. Two days each week were spent on education and formation programmes consisting of six elements: work, social, personal, spiritual, intellectual and physical. The methodology and teaching format included formal presentations, group work, “hands-on” work, reflection of experiences, guest speakers, NZQA study papers and individual projects. In September participants were given a special placement designed to push their limits a little more. Some went to the Philippines and Vanuatu. Others participated in the Army’s Limited Service Volunteer (LSV) scheme and worked with L’Arche. Those participating in the programme were all recent secondary school graduates and came from around New Zealand to participate in the programme. The Gap year is run by Challenge 2000 with support from the Society of Mary. It is a full time project that involves NZQA training, work experience and placement in a community agency that supports participants’ career aspirations and future realities. During the Gap Year participants build up each of the elements required for a balanced life: Work, Social, Personal, Spiritual, Intellectual and Physical dimensions.